Okay, so I admit, I may not wash my brushes every day (which is probably ideal if hygiene and cleanliness is the main concern) but I aim to wash my brushes at least once a week. This method takes me a good 30 minutes to complete and I tend to wash at least 8 brushes each time (depends on what I have been using). I also wash my brushes at night as this allows them to dry overnight and be ready for use the next day, although for this 'How-To' I washed them in the morning. It is really easy though and the end result always makes me satisfied- hee! Let's begin with the How-To! 1. Pour equal amounts of dish washing liquid and oil onto your plate. 2. Place your brush bristles into the mixture and swirl it in the mixture. 3. Swirl it in circular motions until it suds up and you are satisfied that the soap-oil mixture has cleansed your bristles thoroughly. 4. After you have swirled and cleaned your brush in the soap-oil mixture, place it in a bowl with the bristles touching the bottom of the bowl. This is to ensure that the mixture does not enter the ferrule of the brush and damage it, so always ensure that your brush points downward. Even if it is lying down flat on a surface, there is a possibility that soap can enter the ferrule, so it is best to place it pointing downwards. 5. Move on to your next brush and do the same thing until you are done with all your brushes. This is just my preference, but I like to do my face brushes first and then only move on to the eye brushes.If the soap-oil mixture runs out, just pour some more onto the plate. Can you see the brown gunk in the soap-oil mixture? That is what's stuck in our brushes! 6. When you are done swirling all your brushes in the soap-oil mixture, rinse them thoroughly with lukewarm water until clean. Again, as we do not want water to enter into the ferrule of the brush and damage the brush, make sure you rinse your brush with the bristles pointing downward. While rinsing my brushes, I also like to squeeze the bristles to ensure that all traces of the soap-oil mixture is gone. I also swirl the bristles in the palm of my hand while rinsing it- again to ensure all soap is rid off (could not show a picture of this as I was doing the rinsing with one hand and taking pictures with the other!). 7. After rinsing all your brushes, squeeze the excess water out of the bristles with kitchen tissue paper. Then, roll your dish towel into a cylinder, lay out some kitchen tissue paper and arrange your brushes in a downwards angle with the end of the brush resting on the rolled towel and the bristles of the brush resting on the kitchen tissue paper. Sounds confusing? I do not really know how to describe it, but hopefully the pictures below will help explain better! See the downwards angle? This is to ensure that water does not flow into the ferrule (I think I have said this one too many times already hehe)! 8. Leave your brushes to air-dry and then you are done! Say hello to freshly- washed brushes! 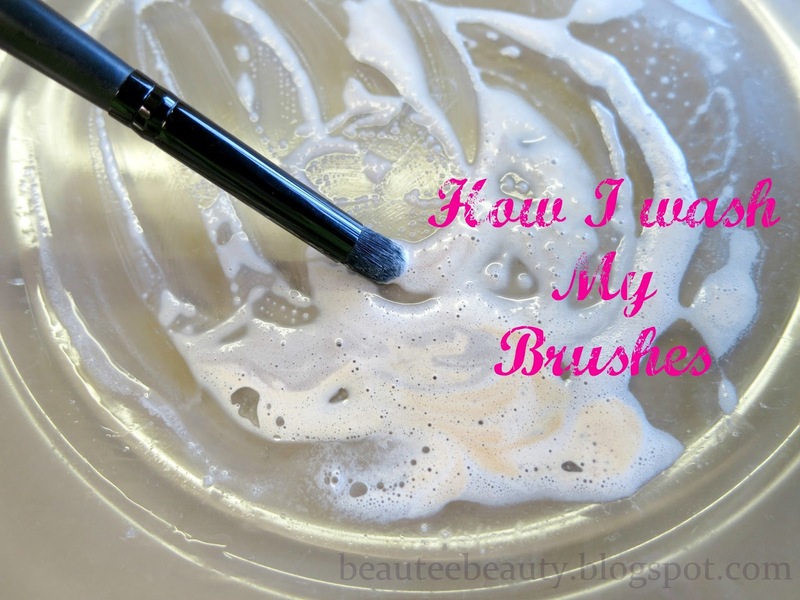 Are you wondering why I use dish washing liquid and olive oil to wash my brushes? Why not just use baby shampoo? I used to wash my brushes with baby shampoo, but for some reason felt that my brushes were never that clean. Dish washing liquid is good for washing makeup brushes as its anti-bacterial properties ensures that bacteria that breeds in the brushes due to the build-up of makeup, natural oils and dead skin cells that get stuck in the brush when applying makeup, are completely destroyed. However, dish washing liquid can be very harsh on brush bristles, making them rough and dry. This is where olive oil comes in to counteract the harshness of dish washing liquid and restore some moisture and softness into the bristles. If you do not have olive oil, you can use sunflower oil (I have tried using this before and the end result was the same). Thanks for sharing .. I never thought to use olive oil, your idea is fabulous..
i've never washed m brushes in the sink before! so convenient!